President Donald Trump waves as he boards Air Force One, Jan. 18, 2018, at Andrews Air Force Base, Md. On Saturday, President Donald Trump will mark the first anniversary of his inauguration as the 45th president, the day on the steps of the U.S. Capitol he promised to put "America first." Trump's tumultuous first year was unlike that of any other president in recent U.S. history, and 2018 could offer more of the same. The president had his share of victories and setbacks amid a backdrop of Twitter storms and, at times, raging rhetoric. Trump's political base seems pleased with his first year in office, touting his efforts to cut Obama-era regulations, install Justice Neil Gorsuch on the Supreme Court, and roll back Islamic State forces in the Middle East. "We were kind of thinking we were going to relax and put Trump behind us and just watch all the great promises that he gave us, and watch him make America great again," said Michigan Trump supporter Meshawn Maddock. "But what happened immediately is that we felt he was under attack from day one." The president's biggest legislative victory came just last month, a sweeping tax cut bill that had been a Republican priority for years. "We are very proud of it," Trump told reporters in the Oval Office as he signed it. "It is going to be a tremendous thing for the American people. It is going to be fantastic for the economy." In fact, there are plenty of signs of a surging economy, and public opinion polls show growing support for Trump's handling of it and even a bump up in support for the tax bill, which many voters saw initially as too favorable to the wealthy. 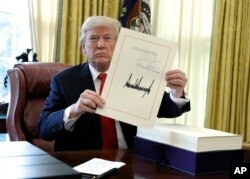 FILE - President Donald Trump displays the $1.5 trillion tax overhaul package he had just signed, Dec. 22, 2017. The tax victory also seems to be helping Trump galvanize the Republican Party behind him, even those who in the past have been cool to his leadership. "This president hasn't even been in office for a year, and look at all the things he has been able to get done, by sheer will in many ways," said Utah Republican Senator Orrin Hatch, who also announced recently he would not run for re-election this year. Passage of the tax bill could help Republicans in this year's congressional elections, where Democrats are favored to make gains, especially in the House of Representatives. "The Republicans did get a tax bill passed, a significant tax bill in December, and that was a major accomplishment for them, so that is something that has put them on a better track," said John Fortier of the Bipartisan Policy Center, a Washington research group. 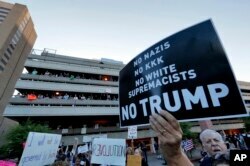 But there were plenty of setbacks in Trump's first year as well, including a failed attempt to repeal Obamacare, numerous outbursts on Twitter and at times inflammatory presidential rhetoric, including Trump's recent reported vulgar description of Haiti and African countries in terms of immigration. That prompted outrage from several Democrats, including Senator Cory Booker of New Jersey, a possible presidential contender in 2020. "Those words don't dissipate like mist in the air. They fester, they become poison, and they give license to bigotry and hate in our country," Booker said at a recent Senate Judiciary Committee hearing. Booker sharply questioned Homeland Security Secretary Kirstjen Nielsen, who said she could not recall Trump's reported reference to s---hole countries. Analysts contend that Trump's controversial and at times polarizing leadership style continues to hurt his poll ratings despite a strong economy that should give him more of a boost. "I think people are judging him on a variety of other factors other than the economy, and that explains his lower approval rating," said Brookings Institution scholar John Hudak. The Gallup Poll found that Trump had an average approval rating of 39 percent during his first year in office, a historic low. Former President Bill Clinton ended his first year in office at 49 percent, an approval rating that contributed to Democrats' losing control of the House in 1994. Trump's low approval rating also could fuel Democratic gains in the November congressional elections, said University of Virginia analyst Larry Sabato. "When there is a wave, the water does not distinguish between those who identified with an unpopular president and those who tried to put distance between themselves and that unpopular president," Sabato said via Skype. For 2018, Trump hopes a strong economy will improve his poll numbers. But the prospect of election losses in November and a Russia probe with no end in sight could make Trump's second year in office even more challenging than his first.